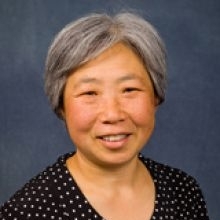 Dr. Gail Li received her masters and doctorate degrees in psychiatric epidemiology from Beijing Medical University. Dr. Li has studied the genetics of schizophrenia and Alzheimer’s disease, and she is currently studying spinal fluid biomarkers for Alzheimer's disease. Dr. Li also investigates vascular risk and protective factors for Alzheimer's disease in community-based populations like the Adult Changes in Thought (ACT) study, which is led by UW ADRC Associate Director Eric Larson. Dr. Li was the PI for a clinical trial funded by the National Institute on Aging, the SimBio study. This study investigated the potential protective effects of a cholesterol medication known as simvastatin for preventing Alzheimer’s disease in normal middle-aged participants. She has used her skills as a geriatric psychiatrist to assess study subjects enrolled in the UW ADRC and then investigated risk factors for Alzheimer’s. She has developed biomarkers, especially biomarkers in cerebrospinal fluid (CSF), for the early detection and diagnosis of Alzheimer’s. In addition to studying the conventional Alzheimer’s biomarkers of Aβ and tau, she has worked with fellow ADRC investigators to determine the relationship of other potential CSF biomarkers, such as brain-derived neurotrophic factor (BDNF), F-isoprostane, and norepinephrine, to brain function in normal adults. As a PI, she was funded by the NIA to conduct a clinical trial of simvastatin on the risk of Alzheimer’s disease in normal adult volunteers using the CSF biomarker as a primary study outcome. As an epidemiologist, she has also been a long-time co-investigator on a community-based cohort study of dementia, the Adult Changes in Thought (ACT) study. She has used the ACT cohort data to publish several articles on the role of cardiovascular risks and protective factors in the development of Alzheimer’s disease.